Aalayam - Colors, Cuisines and Cultures Inspired! : An Indian Sprinkle! A friends mother stands in for my mom and does the honors. Modern day obstetrics guides the medical model of childbirth yet ancient traditions, intriguing rituals and cultural beliefs follow mothers-to-be and with good intent too. Every country approaches motherhood and the arrival of a new life uniquely. The contrasting beliefs, taboos, rituals, the art of gifting and naming the baby across the globe makes for an interesting read. Cultural and social norms play into many of these beliefs and yet they are all unified by a common goal – safe pregnancy and a healthy baby. Hello and welcome and incase you missed our previous post, I suggest you start there. Last time, I shared our big news with you – the birth of our little girl. 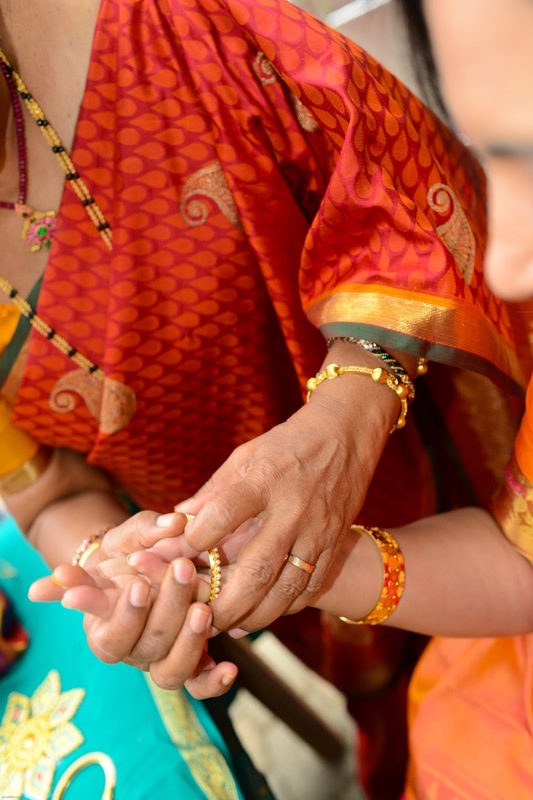 In anticipation of her arrival we celebrated with two showers this past summer and in today’s post I bring you images from the Indian version of the baby shower or as it is known in our neck of the woods (bale shastra). Although, Indian customs do not necessarily call for a ceremony for 2nd births – I say don’t let the etiquette sticklers change your plans. If you want to celebrate your second, third or even your fourth child – I say, go for it! If an actual second shower seems a bit excessive, you could trim the celebration and downsize to a “Sprinkle” instead of a shower! 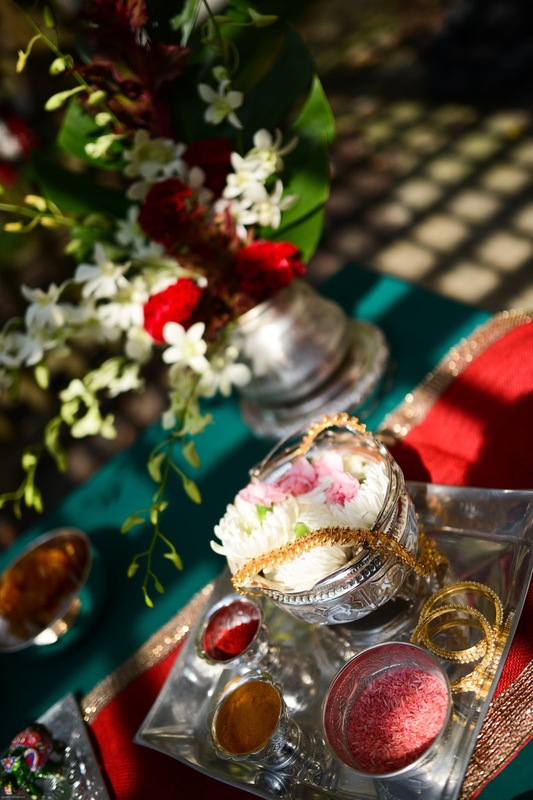 Supriya lovingly packages sweets and savories with other goodies in this beautifully adorned basket! 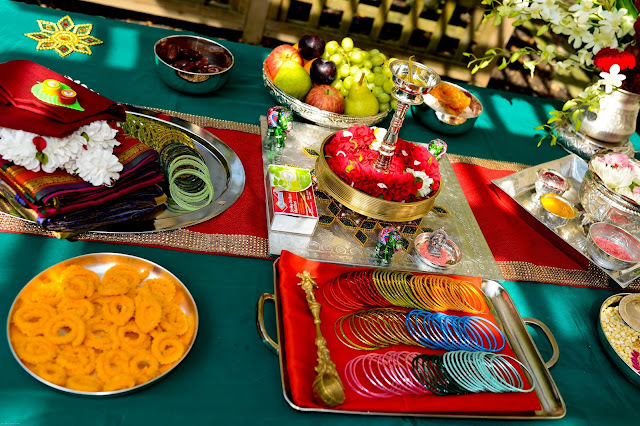 Also referred to as Godh Bharai, Seemantham, Valaikaapu or Shaad in different parts of India – this ceremony essentially celebrates motherhood and showers mom and the unborn baby with many blessings via simple rituals. For me, celebrating baby A’s maiden voyage with traditions as old as the hills not only created a sense of festivity but the symbolism was a great way to keep tradition alive and reconnect with my roots. While I sorely missed the presence of my family, my dear friends once again stepped up and made sure that everything was planned and executed to perfection. In a small, serene and private event at home, my girl friends showered me with affection and I am grateful for their love and support. While there are territorial variations in the actual ritual itself, the central idea remains the same. 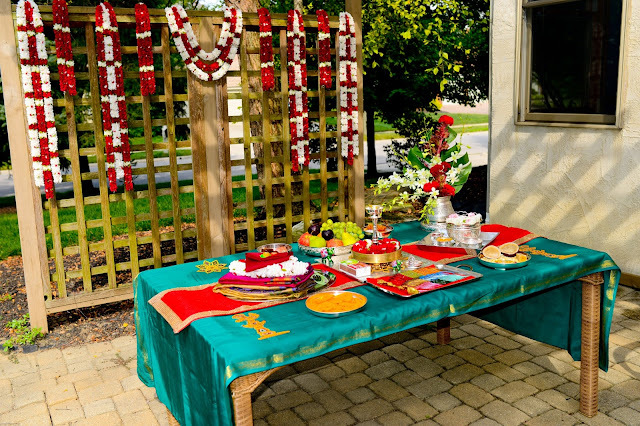 Our Indian sprinkle was inspired by traditional customs but tailored for a simple backyard celebration and resonated with my own personal beliefs without being overtly ritualistic. The girls created an adorned outdoor space for all of us to gather. 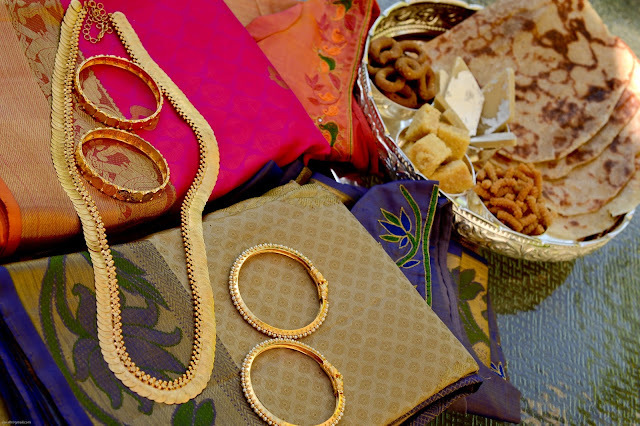 Haldi, Kumkum and flowers - ceremonial essentials! 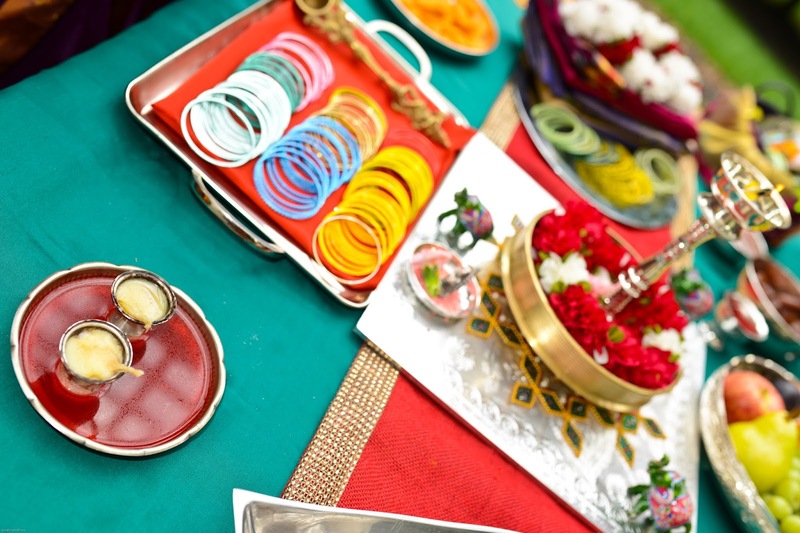 The ideas presented here can easily be incorporated for other Indian/ethnic celebrations especially with Dussehra and Diwali on the horizon! 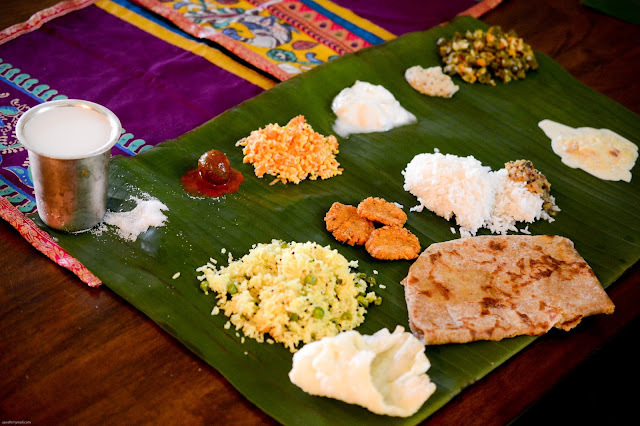 An unquenchable pregnancy longing- bale yele oota (banana leaf meal). Thank you Ma for making it happen! I have enjoyed sharing these celebrations with you. Giving birth to a baby is a fiercely gratifying personal experience and I never felt more excuberant than I did immediately after the birth of my two children (and I know every mom feels that way) and yet for many of us the pregnancy itself can be a difficult journey. I want to use this post as an opportunity to remind any expectant moms among our readers to enjoy your journey and to take care of yourself as your prepare for the arrival of your li’l one. Of course, once the baby comes your life is going to revolve around the baby! Have some fun during your pregnancy and create your own beautiful memories that you can one day share with your child. Dear Aalayam family – the going has been a bit slow at Aalayam these last few months and now you know why – we have had our hands full. But we are now stepping into our most favorite time of the year and we are looking forward to bringing you some great seasonal posts! Are you ready for some fun?? Supriya is up next with her signature Dasara post and you don’t want to miss that! And before I sign off, here is one final image as always! Congratulations :) discovered your blog through OUATT. Lovely pics and narration as usual. And I second, third and back your thoughts to infinity in the matter that all children, no matter what their chronological order should be welcomed with all the rituals and ceremonies that are carried out with a first born child.